Chapter 7 bankruptcy is essentially the legal process of discharging debt, and getting back on track financially. No one ever wants to file bankruptcy as there is a stigma attached that leaves many hardworking people with the feeling that have somehow failed. However, bankruptcy can happen to anyone and is not a sign of failure. It is a sign of the economic reality that many struggle with. Filing bankruptcy in NH or MA can be overwhelming, stressful, and even an exhausting endeavor for the average Massachusetts or New Hampshire resident. Because of what all it entails and what all is at stake, having an experienced and compassionate Massachusetts bankruptcy lawyer by your side can help make the entire journey smoother and less complicated. The law firm of George C. Malonis can be your trusted source for the most up to date and relevant bankruptcy information that may affect your individual situation. We will prepare your petition to be filed with court, help you list and account for all assets, list and decipher information from your creditors, list all of your current expenses, gather tax returns, and protect your rights during the process. 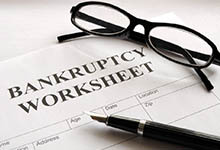 Chapter 7 bankruptcy can entail the discharging of debt through the liquidation of non-exempt assets. Some assets, or property, can be exempt, such as home equity, cars, tools of your trade and basic household necessities. Without a Massachusetts and New Hampshire chapter 7 bankruptcy attorney looking out for your rights and guiding the process, you may give up assets you don’t need to or agree to creditor demands that are unnecessary. Having us in your corner will show the courts and your creditors that you are both serious about fixing your current situation and also that you are fully informed of your rights and protections. We will make sure you fully understand the entire process and know exactly what to expect. With us by your side, there is no reason to be intimidated or overwhelmed when filing for chapter 7 bankruptcy. A Chapter 7 bankruptcy can be the tool that helps you get back to financial independence and security. We can and will be there from the time you feel you need to learn more about chapter 7 bankruptcy until your court process is complete. The law firm of George C. Malonis will fight to protect your rights and help you come out on the other side of a difficult financial time. Have a Chapter 7 Bankruptcy Question? Contact Massachusetts Bankruptcy Attorney George C. Malonis at 978-453-4500. Free Consultations! Great Attorney. Attorney Malonis was very helpful in assisting me with a chapter 7 bankruptcy. He and his staff were so nice and explained the process to me every step of the way. It was a very emotional period in my life and they made it very stress free and gave me confidence. I am now in a much better place!